I picked up The Ocean at the End of the Lane having already read a few (spoiler free) reviews on-line, so I was pretty thrilled to have finally bought it for myself (hard-cover and all). I'm a long time fan of Neil Gaiman—I discovered him in high school and remained a loyal reader. I'm assuming that, if you’re a Neil Gaiman fan, you've likely already read this book. And if you are not a Neil Gaiman fan, if you've maybe only read one or two or none of his works, The Ocean at the End of the Lane is for you. It’s for everyone. The book follows a man who visits his home-town after many years and gets caught up in remembering events that happened when he was seven years old. The incidents begin with his kitten being run over, quickly move to an adventure with the girl who lives at the end of the lane, Lettie Hempstock, to his parents hiring a new nanny, to the darkness that rises a result of these events. It is not a book for children, despite it being about children. The narrator takes quite the cold plunge into reality, its impending starkness and shocking cruelty. I can’t say much without giving major plot points away. But I have to agree with something I read shortly before I read the novel. In Pat Rothfuss’s review on Goodreads, he says that there is truth in this book. And that was what I felt, in a resounding, heartfelt, serious way, when I stepped into The Ocean at the End of the Lane. The characters are real and feel alive, the narrator is easily relate-able, the older women in the story are powerful. I wanted to see the ocean at the end of the lane, I wanted to be one of the older Hempstock women, or at least wanted to learn from them. I wanted to know these people. The entire book I felt like Gaiman had unlocked something deep in my gut that I hadn't known was there. The ending left a hole, like he had sucked something away but also given me something back to stuff into my chest, but like what he gave me back was altogether too much and not enough. This review is vague, to say the least, because I can’t say much without giving it away. 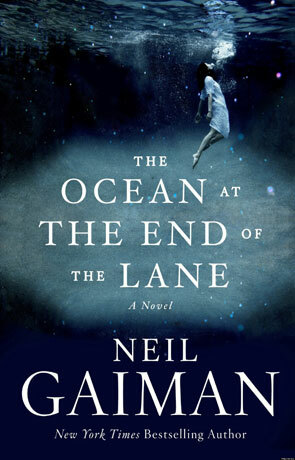 But I can truly say that it doesn't matter if you are a Neil Gaiman fan or not, because The Ocean at the End of the Lane is for everyone, and its story takes place in childhood but it still matters now. Written on 13th September 2013 by Vanessa.